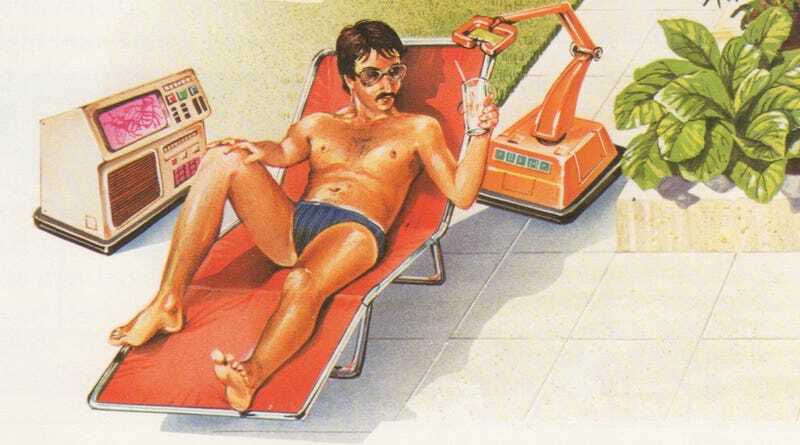 Nothing sells the push-button leisure society of tomorrow better than a farmer with ample time to lounge. Or in this case, a rancher in a speedo, getting served a refreshing drink by a robot. Sure things may be difficult now, but when even farmers have plenty of leisure time and the majority of their work is automated, you'll know that the future has arrived. At least that was the idea. The 1981 children's book Tomorrow's Home by Neil Ardley imagined that living in a rural community of the future wouldn't mean giving up any of the luxuries more commonly associated with urban living. In fact, even if you were a rancher living far from a major city, you'd still enjoy the greatest in technological wonders that society had to offer. A rancher of the future takes things easy at his remote home. A robot waiter brings him a drink and a terminal linked to the house computer provides entertainment and messages. His wife relaxes in the computer room while, at ground level, a computer-guided truck delivers a package. It's interesting that the book didn't simply call the terminal to his right a computer. No, it was a terminal linked to the house computer. Ardley argued that it was this home computer, and the rise of advanced telecommunications technology that would allow for the good life in rural communities. As with so many other future developments, the key is microelectronics. Each home has a computer linked through a radio communication dish to a large satellite in orbit or a distant radio mast. Millions of other home dishes also "talk" to satellites or radio masts, which in turn are linked by radio to communication complexes, making up a vast communication network. In fact, everything from the daily newspaper to library services would be little more than a few keystrokes away. Even voting would be done by computer hook-up from the rural communities of tomorrow. From these complexes, which can be anywhere in the world, the satellite or mast relays your mail and news to you. The home computer displays them on a videoscreen or prints them out on paper. Telephone and television services also come via the network, together with the kind of information services provided by a city library. You can even vote using the network, and it will relay your call for help to the nearest rescue post. However, a fire brigade should not be necessary. The computer keeps a permanent watch on every room with its fire and smoke detectors, and it is always ready to activate fire prevention systems at the first sign of fire. The farmer-as-button-pusher illustration was common among popular futurists of the last century. As early as the 1930s, people imagined that farmers would be able to monitor their fields remotely via TV cameras and a giant viewing screen. In the 1950s the push-button farm became the norm, with farmers kicking their feet up after a hard day of turning knobs and watching television. At work and at play, farmers and ranchers would be enjoying the benefits of all the amazing technologies developed in the last quarter of the 20th century. Despite the fact that we've already surpassed this 1980s vision in terms of miniaturized computing power—farmers included—we're sadly still waiting on that robot butler. Because whether you're a country mouse or a city mouse, we're all still waiting for the robotic mouse to finally arrive in force.